Which species are considered ‘Rodents’? While you may not be aware, there are approximately 4,000 different species of rodents on the planet. Based off their unique anatomy, these rodents are commonly split into three well-defined groups or suborders in order to more clearly categorize them. There are the Sciuromorpha or squirrel-like rodents that include a number of animals such as squirrels, chipmunks, marmot, woodchucks, prairie dogs, gophers, and more. There are the Myomorpha or mouse-like rodents. This suborder includes the most common rodents that people are familiar with like house mice and rats, as well as hamsters, gerbils and more. This is the largest of the three groups. Lastly, there are the Hystricomorpha or porcupine-like rodents. This suborder includes porcupine, capybaras, chinchillas, and more. In this post, we are going to focus solely on the mouse-like rodents, as they tend to be the type we are contacted about the most. Below you can uncover more information about how to prevent rodents from making themselves at home in your California residence. What type of environment do these pests like? While homeowners do not often see rats first hand, there are many different ways you can detect whether or not they are in your home. In California, the most common and troublesome of this species are the roof rat and the Norway rat. It is important to know which type is in your home if you are wanting to control the species. – Norway Rats: Sometimes referred to as brown rats or sewer rats, these stocky rodents are much larger than roof rats. They are known to burrow alongside the foundations of buildings, as well as in trash or woodpiles. Additionally, don’t be surprised to find a Norway rat in your garden or other moist areas around your home. – Roof Rats: Also known as black rats, these rodents are a bit smaller than Norway rats. You can tell them apart from other rat species as they have tails that are longer than their head and their body combined. This type of rat is extremely agile and is known to live and nest above ground. Most of the time, their homes are built in trees, shrubs, or another type of dense vegetation, like ivy. If they are found indoors, it is most common that they will reside in attics, walls, cabinets, and false ceilings. –Mice: House mice are much smaller than both of the aforementioned species of rat. With relatively large ears and small beady eyes, you will likely see droppings, tracks, or fresh gnaw marks when there is mouse activity in your home. What prevention steps can you take keep them away? Since rodents are active for the majority of the year, you will want to check for signs of them periodically. Whether they be mice or rats, there are certain things that will attract all rodents alike to where you live. If you want to do everything you can to prevent them from ever being attracted to your home, the key is being a tidy person in general. Whether it be indoors or out, you can ensure that a mess is the first thing that will have mice and rats heading in the direction of your home. This is especially true when temperatures are extreme. Keeping this in mind, let’s discuss how you can dissuade rodents from choosing your home as the place they want to reside year round. What can you adjust inside of your home? What can you adjust outside of your home? One of the most notable attractants for rodents is familiarity. If they come into contact with familiar scents or nesting materials on the interior or the exterior of your home, because they have infested the space before, it won’t be long before they have infested the same space once again. Plain and simple, rats and mice alike prefer to live somewhere they know there has been former rodent activity. This gives them a bit of reassurance that they too will be able to survive in the same space. This is why it is imperative that you invest in a complete sanitation service once all the mice and rats have been eradicated from your property. A pest control company is perfectly capable of getting rid of old droppings, cleaning grease marks from baseboards, replacing insulation and sanitizing nesting areas to prevent future infestations. Want to Know More About Preventing Rodent Infestations? 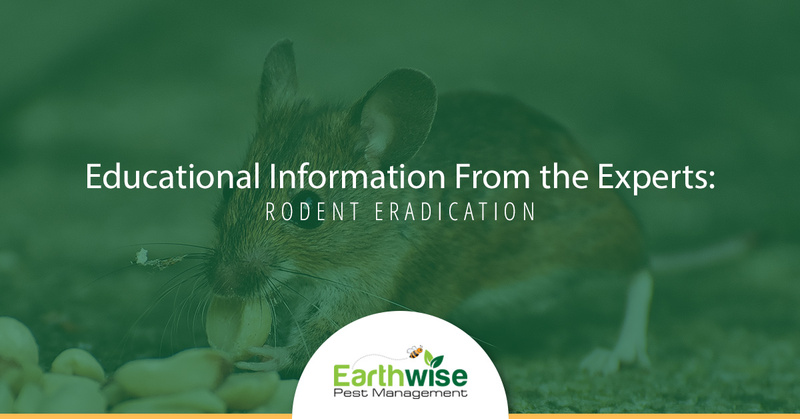 If you want to keep mice and rats out of your home so that you never have to concern yourself with a real infestation, contact Earthwise Pest Management today. We know the signs that rodents are already present on your property as well as how to prevent them from choosing your house as their new residence. Call now for our help!